When Hanlie posted a comment on my last entry on Father’s Day about how she’d not seen a “before” photo of me, I started thinking about what “before” implies. When you lose weight, it’s natural for people to want to compare what you looked like before and what you look like now. Heck, I love seeing how people have transformed physically. In this context, “before” is about what’s changed and “now” is about what’s different. But when I looked at some of my “before” photos, I realized that there’s much more going on in them than just me being fat. There’s a lot of “now” in the “before”s. 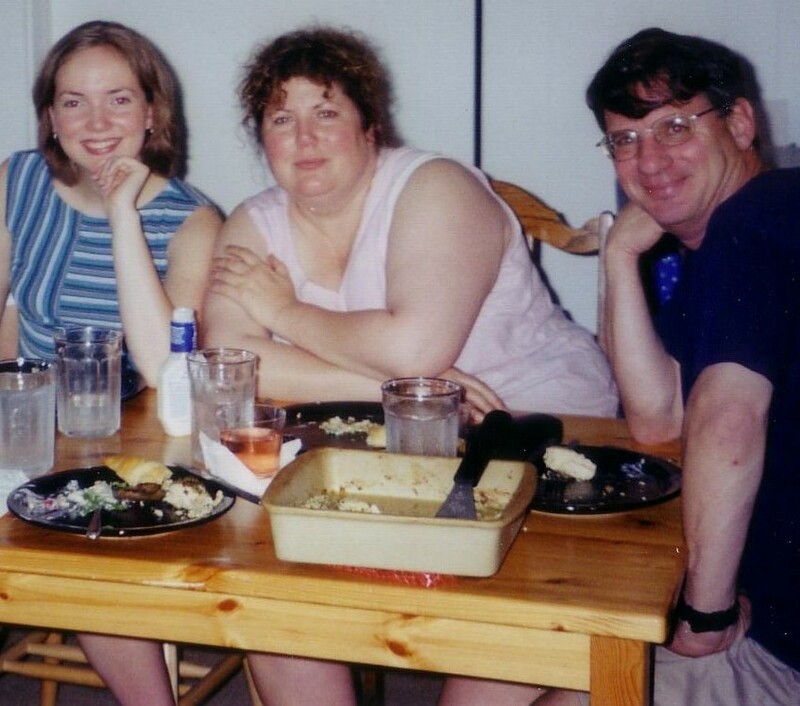 This was taken the night my daughter Carlene (now 26) made dinner for my husband Larry and her grandmother and me. She was going to college, living in our basement apartment, and learning how to cook. She made chicken and crescent rolls and a salad, all of which turned out great. Gave her a lot of confidence. 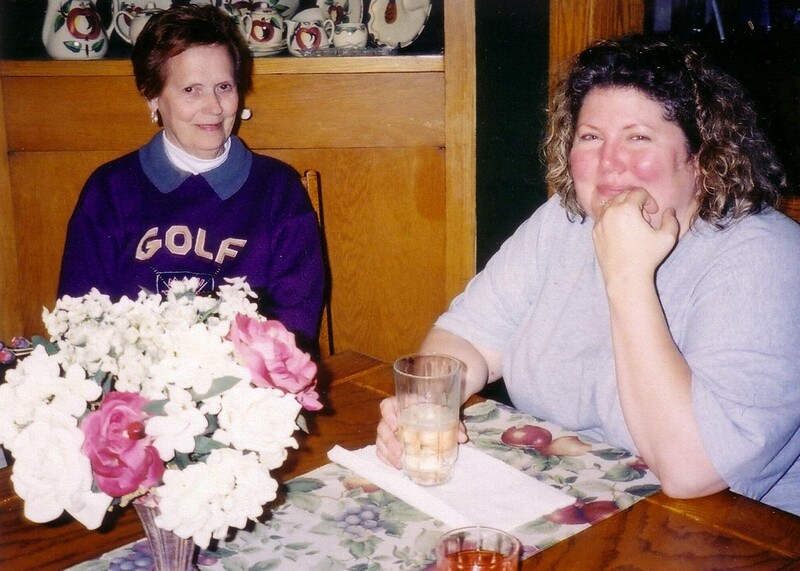 I no longer have all that weight on my bones, just as we no longer have that table and those chairs, Carlene has different dishes, and I’m sure she no longer owns that shirt. My husband had a lot more hair then and he wears different glasses. But we’re all four still around, still family, still cooking and laughing together. This photo’s very difficult for me to take in because…well…there’s so much of me to take in! It was taken Christmas Eve 2003, and I remember seeing my dad out of the corner of my eye standing up to take a photo and thinking, ‘Crap, I hate when he does this. Can’t he see how fat I am? I hate having photos taken!’ all the while trying to concentrate on playing my flute. 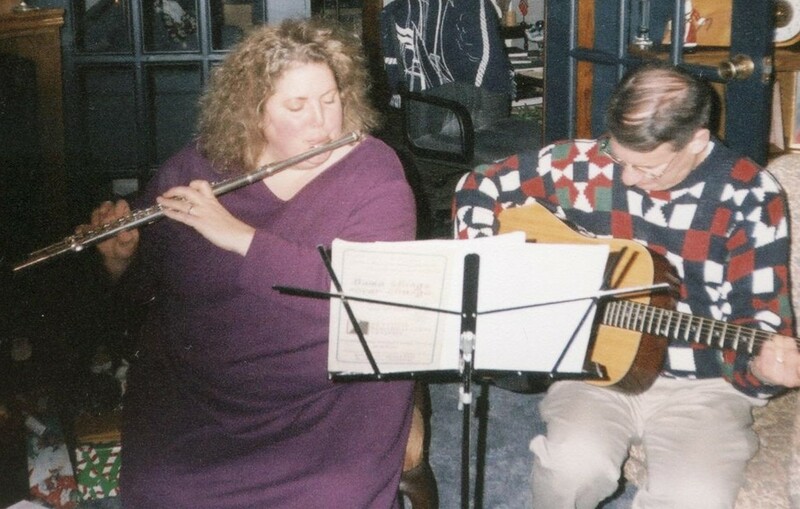 Looking at is as a “now” photo, I see my beautiful flute and think about how much I still love music and still love to play. I see Larry playing his guitar and think about much he still loves to play. There’s nothing “before” about that. It was raining buckets when this photo was taken. 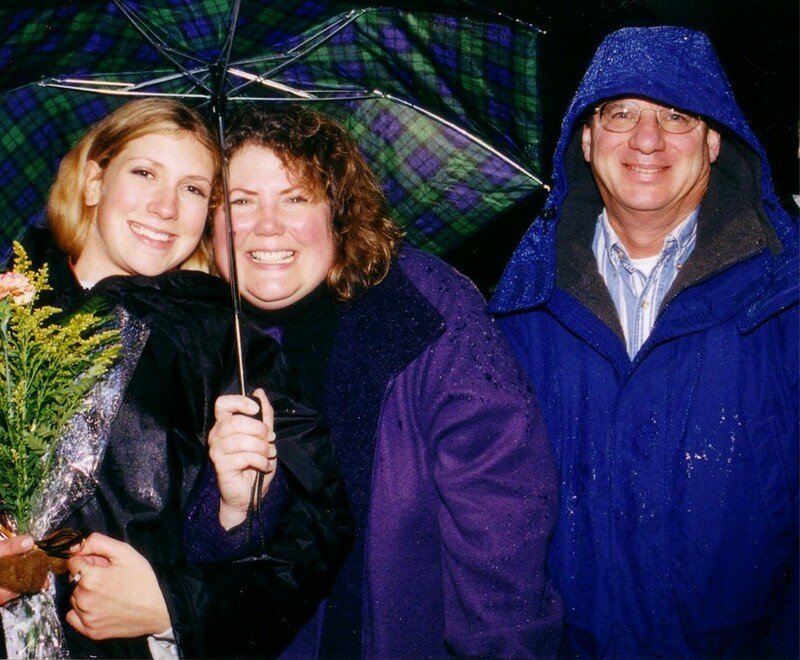 It was the night of daughter Cassie’s last marching band performance at the last football game of the season. All seniors and their parents were recognized in a little ceremony on the football field. I remember, again, hating having a photo taken of me in my size 3X coat, but being so happy for and proud of my daughter. Now, while I don’t wear a 3X coat anymore, I’m still happy for and proud of my daughter (I think we still have that umbrella somewhere, too.). Playing backgammon with my dad. And Dad, if you’re reading this, practice up because I’ll be home in August! Hanging out after making lefse with my Aunt Shirley. Still make lefse, still love hanging with my aunt. Four years separate these photos. What makes the one on the left different from the one on the right is the hair, the weight and the fact that we now have two grandchildren and a son-in-law, we live in a different home, we drive different cars, and we exercise regularly. What makes them the same is the love and respect we had for each other then is the same that we have now. My weight changed nothing about Larry’s feelings toward me or our relationship. 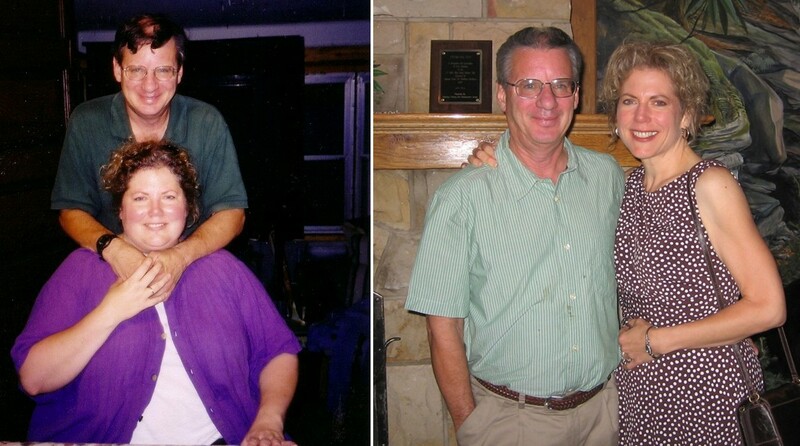 I’m sure most of us still cringe a little when we see “before” photos. But when you look beyond the physical and see the constants in the photos, they become easier to digest. This entry was posted in Uncategorized on June 23, 2009 by Lynn Haraldson. What a lovely post, Lynn. Thank you! Nice, Lynn. I have been carrying around two photos just recently unearthed–one 'before' and one 'after,' but in both I am holding two dachshunds–my 'babies!' Cracks me up. Excellent post. The message that I get is that we have to accept ourselves at all weights and that the good and the bad of who we are doesn't totally depend on the weight we carry (or not). WOW! This was a very touching post. Many people just throw away those old pictures, but it is so true. There is so much more to a photo than the weight. Gosh, Lynn, that just brought me to tears. I have not had my photo taken with my kids since last summer. Thanks for letting me see that I won't hate the photos later… we will love them, seeing how we love EACH OTHER. Getting the camera out now. It really is a very good post. It brought tears to my eyes. It fills my heart to witness when someone empowers themselves – with their own two hands/heart/mind. You are right – even though our bodies change as we lose weight, the feelings we have towards our family and the memories those photos represent are still precious. When I look at my before pictures I cringe too, but they too bring back great memories! Thanks for the reminder. It makes me sad that when I was at my heaviest, I am just absent from the pictures. I avoided cameras (I usually appointed myself the picture taker) and deleted many that I didn't like. My husband tried and tried to get pictures that I would approve of. What a sweetie. I like myself in pictures better now, but I wish I was there in the pictures from when my boys were babies. I'm happy to be a more present parent now. You are right that I do cringe at those before pictures that did make the cut, but that's ok. It is who I was and life was good, even then, in many ways. Very nice post, Lynn! And it contains such a valuable lesson… The fat years are never “wasted” years. They count and have value too, just as we have value at every weight. Only once I learned this, could I start losing weight for real. Hi Lynn. I really appreciate this post and how tough it can sometimes be to embrace the past and where we have come from. I have to say that although I have only lost 15 kgs (33 lbs) and still have 32 kgs (70 lbs) to go, my “before” photos are remarkably different to how I look now. Although I am annoyed at myself for allowing my body to become so large, in a way I am also overwhelmed with pride to see where I have come from and how much I have accomplished. I have grown, I have learnt, I have achieved….. We're still the same people, but as you said, with better habits and lifestyles. Thanks for this post…. And just to say, that even though you were overweight in these photos, you were and are still beautiful. Thanks for sharing! Agreed with Lee–beautiful then and beautiful now! What a great post. I love the comparisons you made. Weight truly does not make the person, and it doesn't change all the great memories of our loved ones! I'm so glad you guys “get it.” Lyn, I'm very glad you'll take photos NOW of you with your kids. It's just weight! Our kids and family and friends are REAL and so much more important. Like I said, I cringe a little at the me before, but in the grand scheme, it's just some fat and bigger clothes. I'M not the fat. I'm the mom and sister and wife and flute player and everything else I was five years ago. I was registering at the Hospital for my surgery on Friday and I had to show my photo Id (very old about 3 years and I am much larger) and the lady kindly said you have lost so much weight you look great! I was surprised because I don't see that and I was talking with my Mom and she said even if you don't notice others do. It is a reminder that even when I think I have fallen I really have done well. Thanks for reminding us Lynn that even though the years pass and we change and move forward our weight does not really define who we are just where we have been. Great post! Oh Lynn, I'm so glad I stumbled across your blogs! You are so incredible, and such an inspiration for me (and many others of course). I really hope to be in your shoes some day – blogging about maintenance! Keep up the great work – I'll be back! Those are /very/ encouraging pictures — thanks for posting them! Wow, what a great post. I have to remember that I need to love myself for who I am now, as well as who I am to become. What a beautiful post. I am still trying to reconcile the “before” me in photos to the “during” me of now…it's a hard thing to accept. Thanks for the reminder to be grateful for the memories, no matter WHAT I looked like. Great post! I'm already planning to take another wedding photo once I've lost more weight. 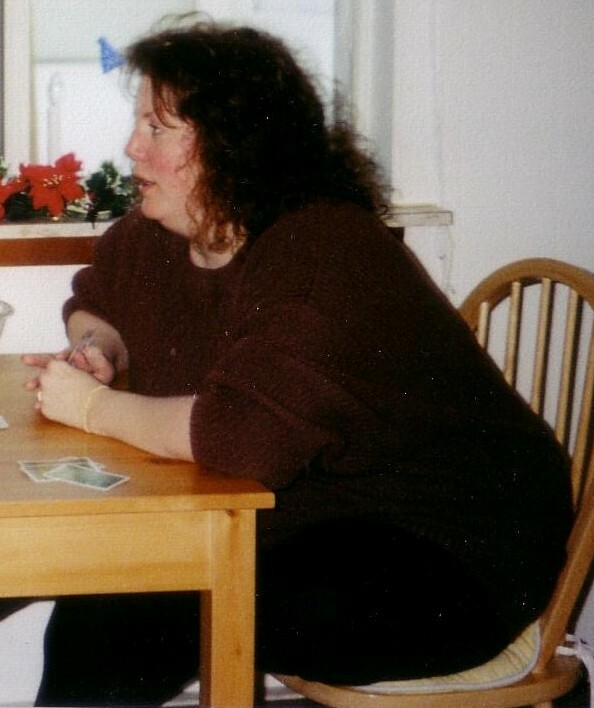 When I married (01-01-08) I weighed 265 pounds and HATE every picture of me. We had a lovely wedding and a fantastic photographer, but the photographer can only do so much, right? When I look at our pictures I remember how happy I was to have my new husband and dear family and friends there to celebrate. This post makes me wonder if a second wedding photo will really be as special. Probably not. I just discovered your blog, so forgive me for being late to the party. This is a magnificent post, and you look lovely in all the photos. I hope you enjoy seeing all these photos because the smiling faces make me feel there were some happy times there, despite what the scale said.